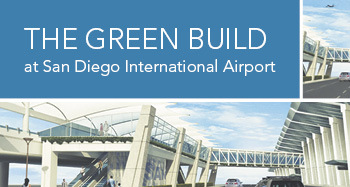 A detailed look of "The Green Build," the expansion of Terminal 2 at San Diego International Airport. As construction of the San Diego International Airport Rental Car Center nears its halfway mark, local businesses have been awarded construction contracts totaling $155 million and small businesses won a total of $60 million. The San Diego County Regional Airport Authority has announced the Green Build terminal expansion project has received five awards over the last couple of months. Borrego Solar Systems Inc. and the San Diego County Regional Airport Authority announced a partnership to develop a 3.3-megawatt solar system at the airport. A lot of things need to be temporarily moved, relocated and rerouted during a major expansion project like Terminal 2 at San Diego International Airport. Things like cabling, traffic lights, signs, fences and parking spaces. The design teams that created the vision for San Diego International Airport's Terminal 2 expansion wanted to make sure it had a "wow factor" for passengers, visitors and staff alike. They insisted it convey a sense of being in a space that defines the San Diego experience. Installing the paging system at San Diego International Airport's expanded Terminal 2 is a déjà vu type of project for Pete Spencer. After several successful joint ventures together, Kiewit Corporation and Sundt Construction, Inc. are completing another successful construction project together at the San Diego International Airport (SDIA).